I have to admit, I have a soft spot for ensemble crime/heist films and while they are few and far between – at this time I can only really think of the Ocean’s franchise, two of which were great entertainment –, when one comes along, I can’t help but give it a shot in spite of what others have been saying about it. 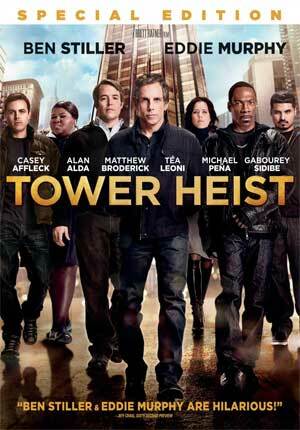 So with that Brett Ratner’s Tower Heist came along with a fun all-star cast and at least unique storyline. While both of those descriptions (fun and unique) are accurate, it doesn’t mean there aren’t a few leaps in logic and outright plot holes that plague an otherwise OK flick. Tower Heist centers on Josh Kovacs (BEN STILLER), a luxury condo manager working for multi-millionaire Arthur Shaw (ALAN ALDA) and manages a group of workers whose sole purpose is to keep the residents happy. These workers, who are central to the plot, include: front desk manager Charlie (CASEY AFFLECK), new electrical guy Enrique Dev (MICHAEL PENA) and sassy maid Odessa (GABOUREY SIDIBE). Life is alright for Josh as he lives in a modest apartment and has opportunities to move up on the corporate ladder by managing a new complex in an exotic location. Also, Arthur Shaw seems to be a down to earth rich guy, but looks can be (and are) deceiving. The FBI, led by Special Agent Claire Denham (TEA LEONI), raids the complex and, after a short van chase through the streets – concluding in an over the top crash and slide – it is charged that Arthur has swindled millions from investors. Making matter worse, unbeknownst to the employees, Josh invested their pensions and 401ks (along with his own). Josh tries to go about business as usual but when one of the employees attempts suicide, he decides he needs to take matters into his own hands especially when learning all that money has disappeared. Meanwhile, Shaw has been released to house arrest (inside his spacious high-rise apartment) and things eventually becomes heated when Josh, along with Charlie and Enrique, goes into the apartment and trashes Shaw’s grand prize: a 1963 Ferrari 250 GT Lusso once driven by Steve McQueen and worth in the tens of millions. This action causes the tower’s General Manager, Mr. Simon (JUDD HIRSCH), to fire the trio. Out of a job and wanting revenge on Shaw, Josh devices a plan after discovering the apartment might contain upwards of $20 million. He enlists the help of Charlie and Enrique as well as of Mr. Fitzhugh (MATTHEW BRODERICK), a recently evicted tenant whose home was foreclosed on; oh and his family have left him and he’s now living in a fleabag apartment. Josh also goes after a neighbor named Slide (EDDIE MURPHY) who was recently arrested and in jail. For whatever reason, he believes Slide is the guy to really get the heist into high gear and after learning of the payout, Slide readily agrees to help but not before testing the criminal abilities of the other members (via shoplifting and lock picking). So, that’s your basic premise to Tower Heist, Brett Ratner’s new crime-comedy that no doubt is really fun and a brisk watch, but where it’s high in ensemble chemistry, it’s really (and I mean REALLY) light in logic. Right now I’m getting into MAJOR SPOILER territory by revealing the twist: then the group finally make it into Shaw’s apartment and find the wall safe, they discover it’s empty. Quite accidentally it’s discovered he had put all his nest egg worth into… the Ferrari. Yep, the car itself is made out of solid gold (worth upwards of $40 million). But, that’s not the illogical nature (although I’m not sure how anyone didn’t know given how much that amount of gold weighs and it had to be assembled piece by piece), instead it’s how the gang intend on getting it out there. One it was out the window, down 4 floors – without drawing attention from anybody inside, let alone outside – into a vacant apartment, out the door and placed in the elevator shaft. At this point, as I recall, we get some suspense moments as Agent Denham discovers the plot and is racing to the apartment and in the end, each member is arrested (no idea how they knew every single person involved) and through a montage we see the Tower workers each receive a piece of the car (hopefully they know somebody who can melt it down and fence it). Well, through a flashback they show where the car was “hidden” and it really raises more questions than answers. Now, with all that described and as indeed illogical as the heist itself was (blowing away the plot hole in Ocean’s Eleven), this doesn’t negate how much fun Tower Heist is. I can’t say the logic elements didn’t deduct my score (probably a good 1 star) but for a movie that features a great crew of interesting actors, some who have seemingly been in hiding for a few years (or behind crappy family flicks *cough* Eddie Murphy *cough*), it’s a light and fluffy movie that you can watch on a Saturday night and forget the next morning… even without a hangover. In terms of the casting, I liked seeing Ben Stiller in the more straight-man role; Matthew Broderick in, well, ANY role given his filmography has included independently financed direct-to-video flicks (not a bad thing, just pointing it out); Eddie Murphy trying to break out of the PG-rated funk; Casey Affleck doing something less serious after a few dark gritty dramas (Gone Baby Gone, The Killer Inside Me); and Tea Leoni who, like Broderick, has king of been MIA for the last few years. As much as I enjoyed seeing Eddie Murphy again, admittedly the character isn’t well utilized. It’s not so much Murphy’s fault but because it is an ensemble and necessary to keep a good pace, each one can only get some much screen time. But when you compare it to somebody like Matthew Broderick’s character, I had a far better reaction to him for whatever reason. With regards to Alan Alda, he plays your typical rich guy douchebag well enough and really, that’s all you need from him: a fine adversary that audiences can hate and root for the heroes to rule the day. Despite problems with the script and more specifically plot, Tower Heist might not have the cool factor of Ocean’s Eleven (or its second sequel), yet it’s still a fun movie that one can sit back and just enjoy watching the ensemble cast work together. Director Brett Ratner has been vilified online and even though I don’t think he’s a great filmmaker, he has brought us in the past two good action-comedies in Rush Hour 1 & 2 (the third movie was a bit of a turkey) and here he directs the action well enough and keeps a brisk pace that plays perfectly for the story on hand. So, while I only give this a 3/5, I’d still give it a moderate rental recommendation. Feature Commentary – Director Brett Ratner, Editor Mark Helfrich and Co-Writers Ted Griffin & Jeff Nathanson sit down for an entertaining yet informative commentary track. Say what you will about Ratner as a filmmaker, to me he records some of the best commentaries out there. The group takes the audience through the story writing process before moving on to casting and actual filmmaking. Deleted/Alternate Scenes (5:58) includes nine scenes that failed to make the cut (or were pared down) and while they’re not bad, they also weren’t necessary to the final film. Gag Reel (4:18) – It wouldn’t be a comedy Blu-ray without one of these, would it? Yep, line flubs abound as the cast cracks up one another. Brett Ratner’s Video Diary (22:42) – I believe this is a staple on most of Ratner’s home video releases where we get an almost fly on the wall perspective on the filming with some behind-the-scenes footage. I actually liked this featurette behind you don’t get the BS interviews with members of the cast and crew trying to explain their characters or the plot (don’t worry, there’s one coming up). Plotting Tower Heist (44:42) is comprised of 6 featurettes: “The Ratner/Grazer Connection Parts 1-3”, “The Conspirators”, “The Ratner/Grazer Connection Part Two”, “Set Pieces” and “The Car”. Together it makes for a pretty good making-of featurette where you get a glimpse at how the project came together, how the friendship between Brett Ratner and Brian Grazer developed, behind-the-scenes footage on the set design, and some of the typical interview footage yet they’re still at least interesting. 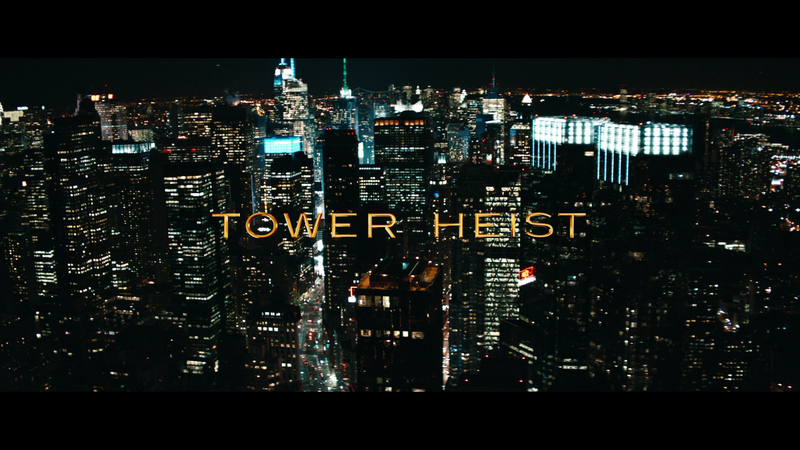 Tower Heist is presented in its original 2.40 anamorphic widescreen and mostly looks good, though even for a standard def transfer, does contain some artifacting throughout. Colors aren’t terribly bright but good enough for a DVD release. The Dolby Digital 5.1 track is pretty good showing off Christopher Beck’s heist-centric score while other elements such as dialogue primarily come through the center channel. Overall, Tower Heist has a few issues dealing the plot’s logic but thanks to a fine ensemble cast, I’m able to overlook any of the script’s shortcomings; it gets the job done with both the crime and comedy.